I am proud to have had a small number of works written for me and I am committed to continuing to promote contemporary repertoire for recorder. This work was commissioned in 2008 from my former teacher and composer Alan Davis. It derives inspiration from the 17th century canzonas of Italy. It consists of five short sections, pivoting on a central passage written in mirror image. The dance-like finale in 7/8 provides a playful climax. Premier given at Huntingdon Hall, Worcester in October 2008. Published by Peacock Press – catalogue number P309. This piece is on list B of the ABRSM syllabus for grade 8 recorder from 2014. This work was commissioned to celebrate James and Caroline’s wedding on 28 April 2012. It is an atmospheric setting of Psalm 67. The text is spoken by the narrator and dramatized by the obligato recorder part which makes full use of the recorder’s tonal range and vocal qualities. The piece is suitable for use as part of the liturgy or in secular performance. Published in print and Braille by Golden Chord. These concertos have their origins in the 1990s when James and I attended the same school, but their DNA is descended directly from the early 18th century. 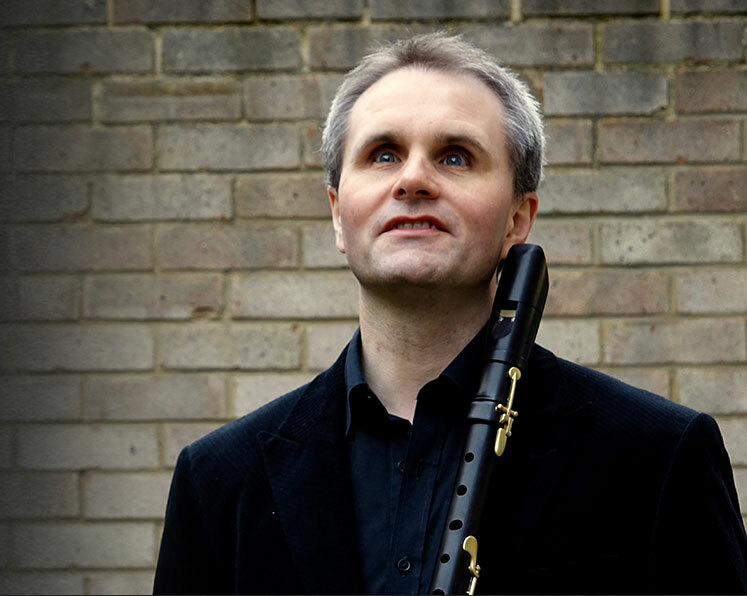 James reconstructs, reimagines and brilliantly recreates music from the golden age of the recorder which exudes charm, elegance and virtuosity. They are perfect pastiches and respectful reawakenings of the music of the Baroque which did so much to renew interest in the recorder. Prelude; Romance; Humoresque; Impressions of Enchantment; A Time Past; Finale. For sopranino, descant, treble, tenor and bass recorders and piano. This serenade, in six movements, was written in 2014 and dedicated to James Risdon and Trevor Hughes. It is in the best tradition of English ‘light music’ packed with exquisite melodies and quirky twists and turns. Impressions of Enchantment is a rare and very effective work for bass recorder and piano and the serenade as a whole is a fun way to introduce the sounds of the recorder family. Lullay and Lament, for solo alto recorder, was first conceived for a recital in the chapel of Westcott House, Cambridge, during Advent 2012. It was inspired by the tender lullaby “By By Lullay” which was written around 1534 as part of the music for the Pageant of the Shearmen and Taylors performed by the town guilds in Coventry. It is from here that the lullaby gained the name by which it is better known today. The innocence of the simple melody is first interrupted and fragmented, before being distorted through irregular and uneven metres in a frenetic dance and flight. Eventually all that is left are the distant strains and echoes of the lullaby, fragile and incomplete. Framing each of these is the pipe of an imagined shepherd, echoing across the valley in a tone of lament. The improvised character of the variations is a small homage to the 17th century recorder player Jacob Van Eyck, while the pipe calls are influenced by the sounds of the Fujara flutes of Eastern Europe. A short diversion inspired by Ding Dong Merrily on High, a popular Christmas carol which has its origins in 16th century France.